DENVER (September 20, 2018) – Denver Startup Week, the largest free entrepreneurial event of its kind, returns to Downtown Denver for the seventh year September 24—28. Denver Startup Week, created to celebrate and grow a culture of innovation and entrepreneurship in Denver, will feature more than 350 programs geared toward the entire entrepreneurial and business community. Events span networking sessions, mentor hours, workshops, leadership spotlights and panel presentations that collectively are expected to attract people looking to start or grow their businesses and gain inspiration. Denver Startup Week is sponsored by Aging 2.0, Chase for Business, Colorado State University, Downtown Denver Partnership and Slack and nearly 70 other organizations and is supported by nearly 1,000 community members, session presenters and volunteers. The week will begin with the Denver Startup Week Kick-off Breakfast, sponsored by SendGrid, on Monday, Sept. 24 from 9 to 10:30 a.m. at the Seawell Ballroom. The event will feature Steve Case, chairman and CEO of Revolution; Daniella Yacobovsky, co-founder of BaubleBar; and Vince Kadlubek co-founder and CEO of Meow Wolf. 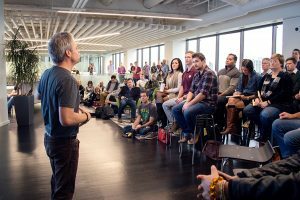 “Denver Startup Week is the biggest and best startup week in the country not just because of the top-tier speakers we host, but also because of the unparalleled talent, community and support of downtown Denver and the 700+ startups that call it home,” said event co-founder Ben Deda, COO of FoodMaven. “No matter your stage of business, company role or industry, Denver Startup Week provides the resources to help you start and grow a successful business. Denver’s reputation as one of the best places to start and grow a business has once again attracted notable speakers and founders including CEO of Fubu Daymond John, DISH founder and CEO Charlie Ergen, entrepreneur and Colorado restauranteur Kimbal Musk, and designer Aaron Draplin. Basecamp, Powered by Chase for Business returns as the hub and epicenter of Denver Startup Week. Basecamp, located at The Commons on Champa at 1245 Champa St., features an exciting line-up of entrepreneurs and innovators sharing their expertise and insights through keynote speeches, panels and mentoring sessions throughout the week. See the complete schedule at denverstartupweek.com/basecamp. For the second year, 50 Denver Startup Week Ambassadors will be hosted at the event from across the United States in a program geared towards showcasing Downtown Denver to individuals, companies and communities across the country. More than 400 people applied to be part of the program in its first year, a strong signal of the national interest in Denver as a technology and innovation hub. Organized by the Denver Startup Week Organizing Committee and co-led by Ben Deda, COO of FoodMaven, Tami Door, president and CEO of the Downtown Denver Partnership, and Erik Mitisek, president at IMAgine Analytics and CIO of Governor John Hickenlooper’s office, Denver Startup Week is focused on highlighting Denver as an entrepreneurial epicenter on the local, regional and national stage, while enhancing community connectivity and providing resources for the startup community and beyond. Stay connected to Denver Startup Week at www.DenverStartupWeek.org, by following #DENStartupWeek and #ChaseBasecamp on social media: @DENStartupWeek and @BasecampLiveDEN on Twitter, liking the DSW Facebook page and following us on Instagram. For more information on Denver’s startup scene, download the 2018 Downtown Denver Startup Report, released September 20, 2018. Denver Startup Week, founded in 2012, is a celebration of everything entrepreneurial in Denver. The weeklong event is intended to unite the entrepreneurial community in Denver and celebrate the great companies, innovation and ideas happening in the city and the people and inspiration behind them. The core programming is centered on the entrepreneurial community with an emphasis in technology, design, social entrepreneurship, manufacturing and business. 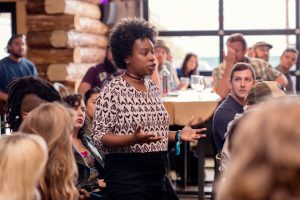 Events throughout the week are organized by both the Denver Startup Week Organizing Committee and the community at-large and include sessions, presentations, panels, workshops, happy hours, social events, job fairs and more. Denver Startup Week Title Sponsors are Aging 2.0, Chase for Business, Colorado State University, Downtown Denver Partnership and Slack. For more information, download the 2018 Denver Startup Week fact sheet and visit www.DenverStartupWeek.org.